Six toboggan runs provide plenty of variety. 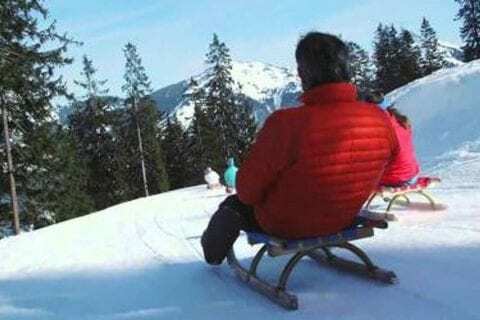 The thrill and excitement of sledding down a hill is winter fun as its best. Enjoy the variety of our toboggan runs, the quaint places you can stop at for meals or refreshments and the stunning landscape. 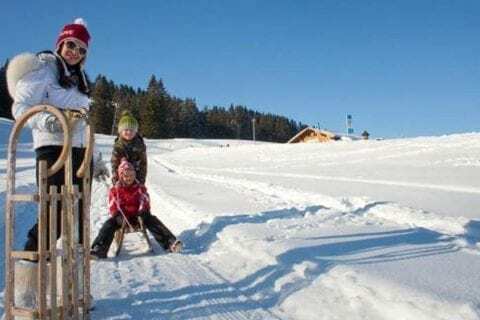 Toboggan run Schattwald: Only a few steps away from Guthof Lutz – in a part of the village called Wies, near the church, you will find a 500-metre toboggan run. The toboggan run from the Krinnenalpe in Nesselwängle at an altitude of 1,530 m down to the double chair lift valley station at an altitude of 1,120 m has a length of 3,800 m. You can go up there very conveniently by cable car and stop for a bite to eat and drink at the Krinnenalpe restaurant. Daily open, at least until 5:00 p.m. Thursday and Sunday are sledding nights (open until at least 8:00 p.m.). Go up conveniently by eight-seater gondola and enjoy the fabulous view of the snow-covered landscape. Afterwards choose one of the three toboggan runs (each one is 3.5 km) to whizz down the mountain. Sleds can be rented at the Hornbahn valley station. 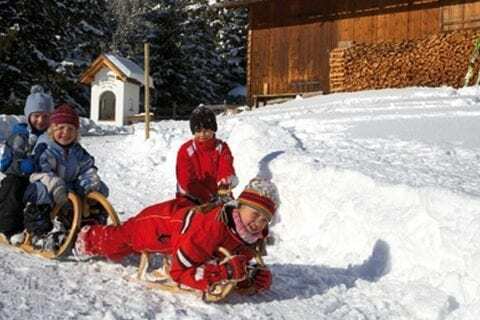 According to the latest ADAC test, the Oberjoch toboggan runs are the best in Germany and are rated as ‘very good’ in terms of safety and quality. Starting out in Jungholz you can either trek up to Jausenstation Alpe Stubental by foot or get there more conveniently by ‘Almtaxi’. The toboggan run down the mountain is 3 km long. Night-time tobogganing is every Wednesday and Friday. You can rent a sled at the Jausenstation. The Adlerhorst toboggan run is an easy 1.4-km run, which takes you back down towards Tannheim Valley. The mountain restaurant Adlerhorst is perched on a rock at an altitude of 1,260 m and offers hungry tobogganers drinks and tasty food. There are also magnificent views of Lake Haldensee and Tannheim Valley. The toboggan run winds itself gently down towards the valley and finishes with a faster straight section. There are fixed tobogganing times: During the week from 2:00 p.m. to 5:00 p.m. except Wednesdays. At weekends it is open all day. Night-time tobogganing is available at weekends and on request. 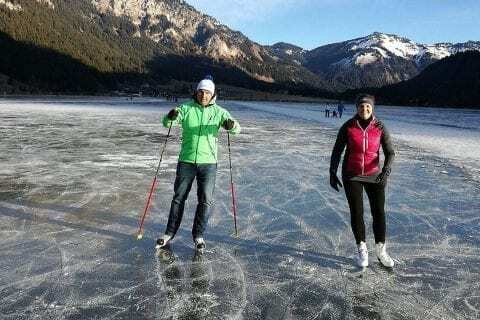 Those who are young and young at heart and enjoy performing pirouettes and skating figure eights are recommended to make a trip to Lake Haldensee, where they can ice-skate on a natural, frozen lake. If you want to do something more sportive, go to the Tauschers Alm, above Lake Haldensee, where you can try your luck at curling. Fun is guaranteed for all ages!